Game Developer Ken Levine's hit Bioshock was developed, he says, due to his fascination with "utopian civilizations" and his "discomfort with extreme ideology." 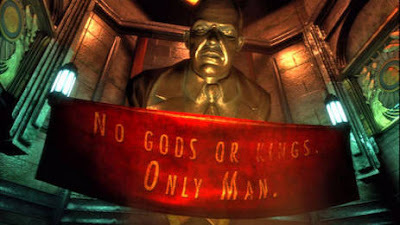 Perhaps it's little surprise then that he chose Objectivism as the underlying philosophy behind Bioshock's virtual dystopia. This Randian influence has attracted comment from the ARI's Executive Director Yaron Brook, who claims that while Levine has "misrepresented" Rand, nevertheless "any publicity is good publicity." "My son has to find his own way in life," he said. "There are certain games I wouldn't want him to play, like Grand Theft Auto, games that celebrate criminality. GTA is a ridiculously fun game. None of my friends ever got the urge to steal cars after playing it. Just a fun way to unwind. Very interesting story though. Thanks for posting it. Am I the only one struck by the fact that due to the insane prices (caused by runaway capitalism), you must by necessity circumvent the system (via hacking) to survive? Or that vending machines contain devices that expedite hacking?